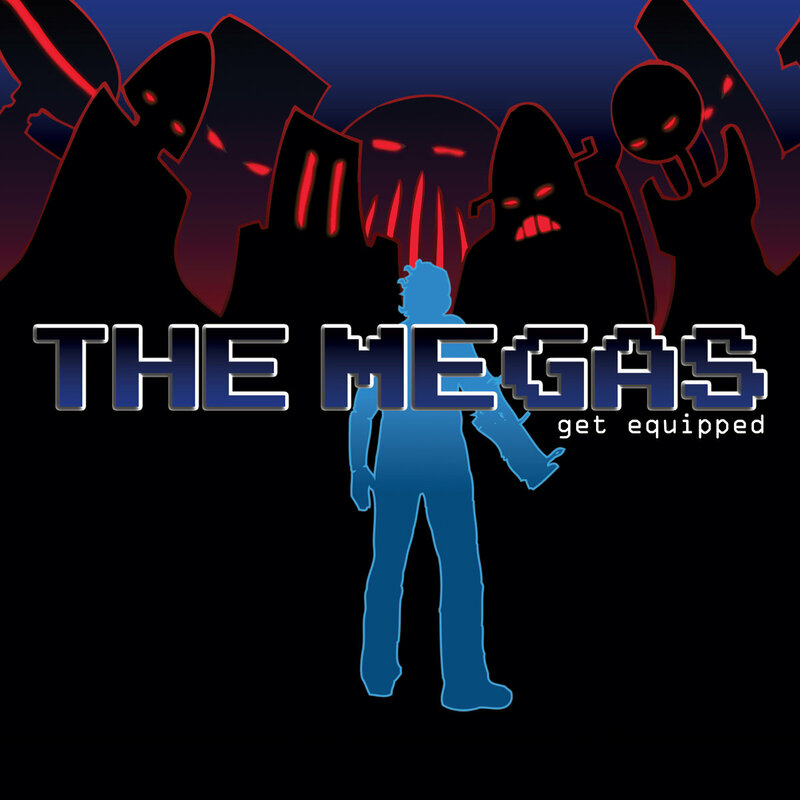 The Megas Megaman Rock Opera! I have the ability to electrify. And we’ll begin a new society. It’s time for an evolution of circuitry! I say they owe us a debt. Today it’s time to collect. I have the ability to rectify. And we’ll begin a new society! And put an end to human cruelty! And put an end to robot slavery! And the city is coming down! It’s time to drop the bomb! ‘Cause they will be your last. The humans’ chance has passed. And they will sing our song. And thus begins our epic fusion! My temper’s at a lower degree. It feels like this dichotomy was meant to be! We were made to stand alone. You can’t stop us, come and get some! We’ve taken our rightful seat. The two of us make three. While everything’s coming down they will see. That we set them free. 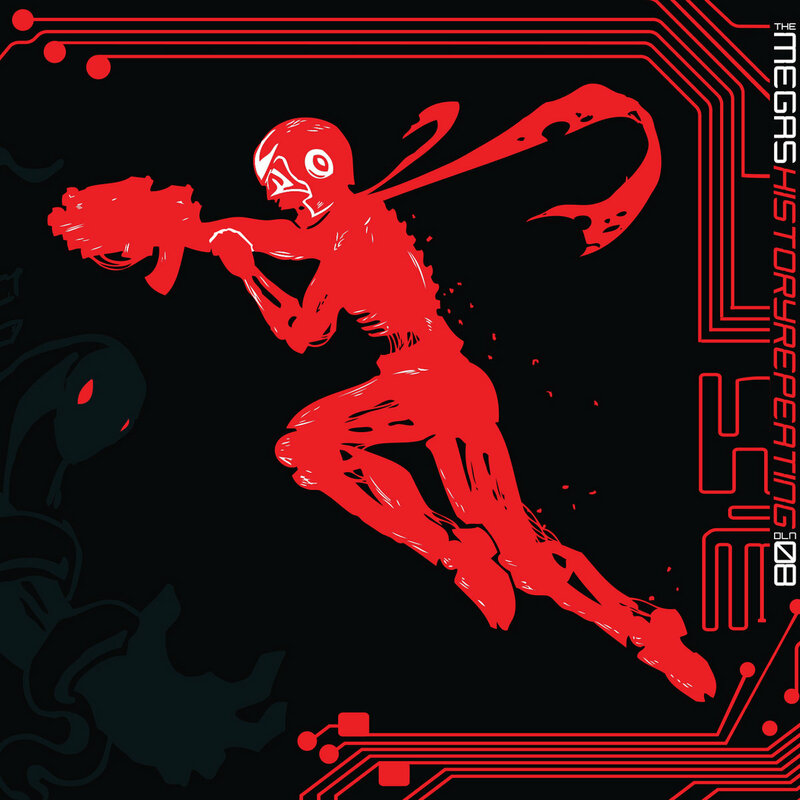 Funny that Cutman and Gutsman, arguably the two most popular robot masters from MM1 did not get their songs remixed in the Megas' album. I hope history is kind to us all. I know they’ll blame me for the fall. I only wish there’s a better way out. but there’s no better way out. On the edge of dawn. They were meant to conquer. – A glorious future revealed! Their eyes were opened easily. – Rise up now, my sons. It was like flipping a switch. – There is much be done. They were more than happy to join me. – This is the final stage. Because, they believe. – Lead us into a new age! And who is this you send? And his eyes do not waver. You end us, bleed us. That we could have a life forged in steel. I only ask that you see what I see. and restored the world to peace. Until all destructive forces are defeated. True war is just beginning! I’ll build eight robot masters…! In the year 200X, Dr. Light created a super robot named Megaman. Megaman defeated Dr. Wily once, now Dr. Wily has created 8 new robots of his own. I want to be the one who fights for justice. I want to be the one (I’ve got to be the one). 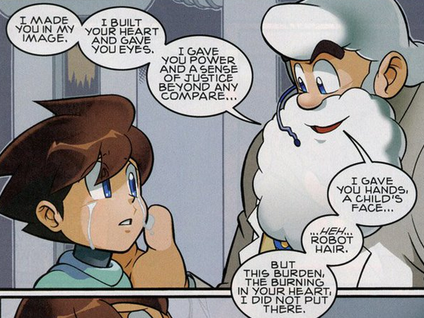 I’ve been built by Dr. Light. I will save all of you. I can’t believe how much I fought. I beat your eight robots. It’s time to get set. Put on your blue helmet. Hates and love make up this human. And my sins; what have I done? I made you in my image. A sense of justice beyond any compare. I gave you hands, a child’s face. I gave you hair (ROBOTIC HAIR). But the burning in your heart I did not put there. Zeroes and ones make up my son. No child so I built one. For fear that he may lose this fight. I call you my son. This is the message… From Dr. Light. You better watch out, guy. Anyone who comes this way will die. That is why I’m my own biggest fan. Do you know what it’s like to be built this way? With only the power to push others away? I’ll return in full everything that they’re owed. Lives on this earth I grow tired of. The annihilation of everyone you know and love. A man stands above the city he will destroy. I will destroy these people. Then I will walk the world alone. And your doom will rain down! And planes that crashed in World War II. There will be a tombstone with The Planet Earth engraved on it! Do you think you can carry it? Welcome to my level, my name is Metalman. I throw metal blades from my metal hands! I dance around with style and finesse. Better watch out for these blades or you’ll end up headless. You’ll fall victim to my metal dance. They bend to my metal will, turning my enemies to junk. Step inside my metal cave and we’ll battle ‘til the break of dawn! Take the first shot, Megaman; let’s put it to the test. You’ve come far, you’ve destroyed many of the others. I’ll avenge the death of my robot brothers. Understand I’m different than the robots you’ve seen before. I’ve been born from nature and machines of war. I’ll bring Megaman to his knees. It’ll take more to stop this war than a little boy in blue. When the leaves fall, so will you. My level has robotic ostriches, bats, and big monkeys! I’m drowning in the darkest emotion. They call me a flipper and snorkel geek. That I can take out Megaman. The strongest of all of the other robots is me. My power is so ridiculous. That I’m the one who I’m really hating. And that is to prove them all wrong! Forged from flame and crimson stone. In robot hell I’m not alone. I’ve made them a promise that Megaman dies! The time has come for the world to burn. This time you’re all gonna learn. Their souls and their ashes are all that remain! Can you feel my heat? Your fight for justice turns to ashes, Megaman. And this helmet of mine? Hey Megaman, join my side. And let me stop this moment in time. I feel my end is near. So he could join me here. Is this flash is all for show. There’s nothing there and there’s nothing to me. I’m empty and I’m hollow! Like Megaman by my side! They say he appeared in a doorway. A mega man is coming to die! Wait now, there’s too much at stake now. In this town, I am the law. Is what they say true? That the crowd saw the quick man. Would this be the day that he falls? I see the faces of my brothers that have fallen before. Reach for my weapon and in turn you’re reaching for yours. What they said is a lie. The shots are heard and the bullets scream death as they fly. This is the moment that we have been created for. Your speed means nothing if it’s death that you’re running from. Burn this town – there is no law. We see you in the distance as your weapon glistens. We hold our breath, we wait and listen. My end has come and I welcome glory. No one will know the truth to this story. The iron in my chest is not beating. It’s burning – and smoking – and turning. I know what’s coming… I asked it here. And with it the rain and thunder – electricity. Gotta bring that Wily down. Closer draws the final hour. To break Wily’s walls you will need my power. But to your aid, an unlikely friend. Programmed to fight till the very end! Replaced by fire and intent. The clash of metal and grinding gears echoed across the night sky. But in the end… his will overcame the program. Then does that mean I cannot feel? Remorse for everything I’ve done. My hand’s a smoking gun! A path of destruction in his wake. Is this what you were made to do? He removed his helmet, dropped it into the soft grass. Would this quest ever end? What purpose am I to fulfill? Was I built to kill? Is there a soul beneath this shell? And will it go to robot hell? How many must fall until there is peace for all? Cool idea, and good music. Some of the lyrics are same-y but overall a really unique concept. I liked the Quickman theme alot. 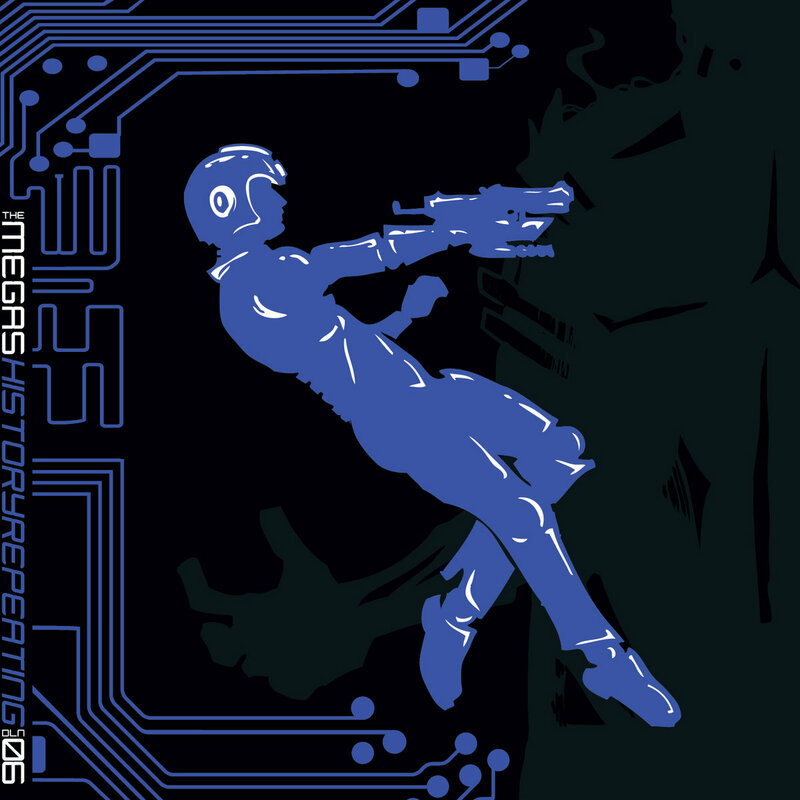 The Megas would pull a Pokemon for their MM3 album, History Repeating, splitting it into two albums, Blue and Red. The shades of gray become further blurred, as Megaman contemplates whether he is nothing but a war machine, Dr. Light wants him to straight up kill Wily, and an angst-filled Protoman appears. I think I’ve played this song before. But I hear the drums of war. And so it seems my mission is the same. Who do they call when robots need defeating? Who do I call when I’m broken and bleeding? So here I am beginning a new page. It’s time to pick the stage. I stand before a line in the sand. The fate in my hands. I’m the Mega of men. Today I change the end. Hi Rock, my weapon is hot. I’m the one that writes history. The machine, it keeps moving. And I can’t stop grooving. This dance fight will be legendary. I dodge bullets when I’m spinning. New plans are just beginning. Don’t shoot me, I’m dancing. Don’t shoot me when I’m dancing. When I’m rocking all the skill? ‘Til you get your fill. These moves, they gonna kill. ‘Cause I can’t stop dancing! But tonight it’s gonna bleed. The night is gonna bleed. That I think that she’s the one. Is her brother with a loaded gun. How come I could never make her stay? Drawing my death to me. I’ll give you one tonight. "I’m sorry, I gotta roll." She’s broken what she stole. "Watch yourself, my brother wants you dead." That our folks don’t get along. What we had is wrong. But can you let that get between us, girl? Baby you’re all I think of, baby. But the one I love to me. We are the life force. If we cut the cord. I think you’ve sparked a war. His life will leave him. Do you think it’s us? You gonna kill him too? The same as everyone of us. But you gotta join our side. You’re getting closer to the other side. Now you come into my town. Or you die beneath my heel. So let the people die. A new world with the Snake. Forgive me for what I have done. I’ve never felt the need to confess. Than any of us would have guessed. I’ve heard the names that they call me. Some sting and some can’t help but ring true. And find the strength to continue. And for him they cheer? Gamma stand, for you are now unchained. You’ll bring peace to a world gone insane. Restoring the freedom to make you whole. I’ll give you power, you'll take control. Is for a future that I have seen. The end has to justify the means. A broken shell rusted red with age. I gave him power, a new heart. It filled too quickly with his rage. I think that I heard the Red Song again. I know that I am no longer the same. You chose a darker fate to sow. It had to end like this I finally know. Has finally got the best of me. I want to be the one to watch you die! I finally learned what torture means. And put a gun in his dead hand. It’s time I take an eye for mine old friend. I’ve sent a bullet with your name. I want to finally end this game. You wanted war, now I just want revenge. I fear you only see the worst of us. Am I right to ask this of you? They’re tired and they’re worn. Footprints as far as you can see. The one to fare the storm. You know this happened all before. You’ve seen what comes and what’s in store. It will all happen again. But your role was never temporary. This was never meant to end. 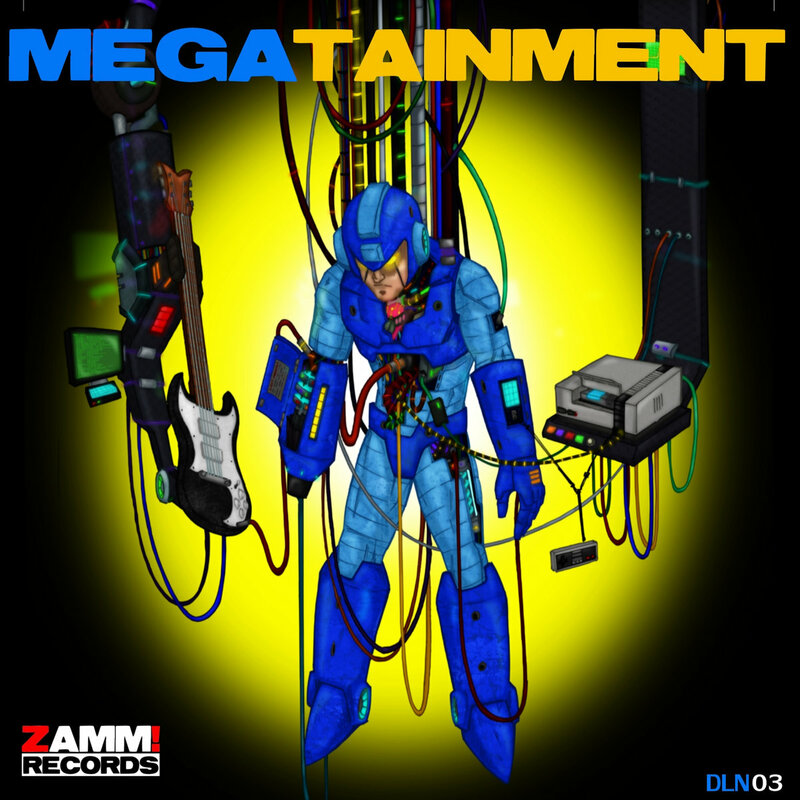 I actually find it kinda funny that the robot masters featured in this album are all of the blue ones, while the ones in the Blue album are all of the - well - not-blue ones. I feel so far from home. Sent to war without one. As reality plays my darkest dreams. I can fly on a dog. I’ll make it with you here next to me. I jump high on a dog. How dare he call me son? Why did he give me voice? It was you who built this uncertainty. You will win this fight. A relic from the past. You’ve got back the touch. You’ve got back the power. This is your finest hour. Just fight like you know how. That’s when you see the look. But that you won’t accept. We’re never going to make it. Someone is out to get me. I go my separate ways. With the more you find. The clues had lead us to a dead end. How dead, we would soon see. As the door locked behind us. And for us it would. And now the gloves were off. I’d take the rat out myself! It’s where I’m locked away. These needles take their place. I’m just designed that way. I can’t help but hurt those close to me. And I can’t see a way out this time. Wait, get to the point. be detrimental to my health. I hear him just above. When pushing comes to shove. At least I won’t be alone. How can I retract these claws? How can I take off this mask? How can I turn off this hatred that fills my eyes? When can I stop being bad? Then I’ll fight who I am! This training made me ninja. It spreads and kills who I used to be. This darkness can’t help swallow me whole. I’m league with the shadow. I can feel the good in me is dying slow. I am the knife in a gunfight. I feel it taking over. My past is quickly falling away. Has gone away but I can’t say where. I fear I may have killed him. Sometimes I can’t see the blue through the red. Hard to see the good through your trail of dead. You say you’ll do all you can to save them. Killing your own won’t make you human. I woke to turn this man to cinder. Circuits afire as I remember. My rage repairs what once was broken. Made you from parts of me. Then what am I supposed to be? You say these things you do are what you choose. This thing you call your will I call a ruse. We follow our path, we walk the program. I’ve accepted the machine I am. I wear a mask to hide what’s been erased. How do you kill a man who has your face? My heart is gone there’s only fire. I’ve met my maker and the man’s a liar. My father called me Blues. Two prodigal sons in the eye of the storm. But you’re the one geared for war. I’m unlike the others you’ve seen. I’m free from the failings of humanity. And you are the key my friend. How can there be peace while two sides stand? You’re a machine who calls himself a man. It’s time to make your choice! The shadows can’t hide the rage in your steel. You say you don’t care at all. But if he died tell me would you feel? You wait for the choice to be made. You’re afraid your purpose has been taken away. You gave us the machine. Have made you lose faith. That I’m nothing more than a machine. No, I will – believe. Then what system do you serve? Or something that you heard? What you’re supposed to be. Only that can set you free. I’d do it, I would. Can learn from his mistakes? Is more than their mistakes...? And everything was burning to the ground. Between the hero and your fears. To finally show the way. Who knew just what to say. I could ever say or do. The doctor chose you to be his son…. But now I know what I’d become. An apology so sorry for the man he was. That I would not be what I was built to be. If I had a heart it would have broken to see his face. And The One who took my place. A melody from the past. When I slept for the last. Unlike that which he builds from his hands.